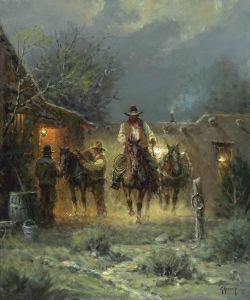 Packin' Alone is vintage G. Harvey. Little appeals to the artist as much as the day by day life of the cowboy. Packin' Alone has its advantages and disadvantages. Being alone with one's horses in some of the most beautiful and dramatic country in the world can be inspiring; but being alone when the elements are not favorable or when disaster strikes can be formidable. So, Packin' Alone only begins the story as the cowhand starts his journey. Who knows what might inspire or befall him in the days to come?